Sriharikota, India: Prime Minister Narendra Modi today witnessed the successful launch of the Polar Satellite Launch Vehicle – PSLV-C23 from Sriharikota. 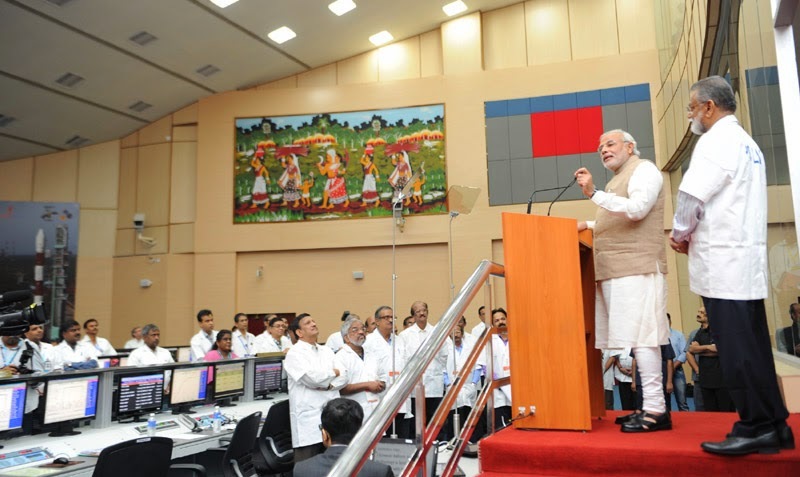 In his congratulatory address at the Mission Control Centre after the landmark launch, the Prime Minister called upon the space community to proactively engage with all stakeholders to maximize the use of space science in governance and development. India must fully harness this expertise in space technology in the developmental process for social change, economic development and resource conservation, he added. Speaking of India’s age-old ethos of the whole world being one family, the Prime Minister said India’s space programme is driven by a vision of service to humanity, not a desire of power. He said India has a rich heritage of science and technology, including space. Modi said the works of our ancestors, who included visionaries like Bhaskaracharya and Aryabhata, still continue to inspire generations of scientists. He added that India must share the fruits of its advancement in space technology with the developing world, and neighbours in particular. He called upon the space community to take up the challenge of developing a SAARC satellite that can be dedicated to our neighbourhood as a gift from India. Modi said we can be proud of the Indian space programme, which is fully indigenous, developed in the face of great international pressure and hurdles. He described it as a domain where “we have pushed beyond mediocrity to achieve excellence.” He said the moon mission was inspired by the vision of former Prime Minister, Atal Bihari Vajpayee. Among ongoing projects, Modi referred to the Mars Mission, and the satellite-based navigation system. The Prime Minister called for involving India’s youth with space. Modi said he was pleased to have met the young scientists as Sriharikota, and admired their work and their achievements. He commended Dr. K. Radhakrishnan for his leadership, and said India’s space programme is the best example of his vision of scale, speed and skill. He wished the team of scientists the best as they prepare to insert our spacecraft into the orbit of Mars in a few months. In a speech made in a combination of English and Hindi, Modi spoke of the Tapasya made by generations of scientists, in a long journey from Upanishad to Upagrah. He remarked that he had met four generations of scientists during his visit to ISRO. Andhra Pradesh Governor Narasimhan, Andhra Pradesh Chief Minister Chandrababu Naidu, Minister of Parliamentary Affairs Venkaiah Naidu, MoS, PMO Dr. Jitendra Singh, Secretary Space Dr. Radhakrishnan, and eminent scientists Prof U R Rao, Dr. Kasturirangan were present on the occasion.